On occasion I do make things I don’t particularly care for – for John. He puts up with a lot of dishes he’d rather not eat. Plantains are part of the banana family and I find them extremely unappealing. Of course in our Latino neighborhood the grocery store carries plenty of plantains. 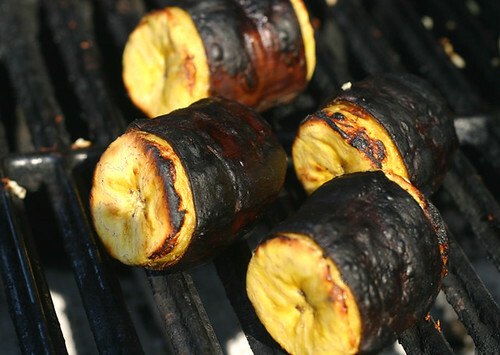 I was reading the BBQ Bibleone day and saw this EASY recipe for plantains. Let them turn black on your counter top – then they’re ripe. Cut them in two inch sections. Throw them on the grill – roll them around until the ends get all poofy and caramely and there you have it. John was in HEAVEN! We also had them sliced up in our Cuban Pork – a true Umami experience! I like platanos but stay away from them because of the caloric count but grilling makes them better than frying. Good idea.